Customers that operate compact machines now have a new power option when adding equipment to their fleets. 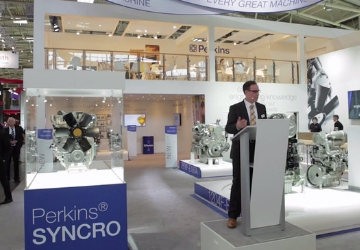 The Perkins Syncro engine line has been engineered to deliver value and performance across a broad power range that allow customers to take advantage of growth opportunities in their fields of operation. Delivering between 39hp and 134hp, the Syncro engine line allows for great flexibility in machine development. Perkins engineers redesigned the 1.7-liter and 2.2-liter engines that extend its global offering and gives customers a high-performance, high-value powertrain. Multiple engine features include an electronic fuel system and multiple installation options. The 3-cylinder, 1.7-liter engine provides a maximum of 39hp and up to 120 Nm torque. The 4-cylinder, 2.2-liter turbocharged model delivers 48hp and up to 165 Nm of torque. The turbocharged aftercooled variant ups the power to 67hp and up to 208 Nm of torque. Operators will enjoy the low-noise characteristics and low fuel consumption that reduces operating costs. Both engines are designed to provide robust and adaptable power solutions for compact construction, agriculture and industrial engines. The 2.8-liter, 4-cylinder version has a maximum of 74hp and 325 Nm of torque. The 3.6-liter option delivers up to 134hp and 500 Nm of torque. Perkins challenged its engineering team to come up with something new when designing the 2.8-liter and 3.6-liter engines. The result is a ground-up produced engine in a modular, clean sheet design. • Compatible with more than 80 machines. The entire Syncro line has undergone an extensive validation process to guarantee performance across the power range in heavy duty work. These engines have withstood more than 20,000 hours of testbed validation under the harshest of conditions. The predictive engineering is backed up with the most physical field test program in the industry. The result of this background work is a longer maintenance interval. By extending maintenance checks to 500 hours operators get lower operating costs and more uptime for their machines. The extensive testing and engineering is backed up with a two-year or 3,000-hour warranty, giving users confidence in their decision to choose a Perkins engine. Perkins Pacific’s extensive and experienced dealer network is also available to design, service and maintain your Syncro engine.